We’re all aware that we should have more whole grains, beans, and legumes in our diet–we’ll talk about grains later, but let’s consider dried beans now. They taste good, are good for you, and economical. Beans are a pantry staple for me–both canned and dried. The canned ones are mostly for “emergency” use. It’s very easy to cook your own dried beans–especially if you use a slow cooker or put them in a slow over. Either way, they are on their own without needing attention from you, other than checking them occasionally. The advantages of cooking your own are multiple: the texture and flavor are likely going to be better than those coming out of a can; you can control seasoning (and the amount of salt), and you have so many more different heirloom beans with different flavors! Yes, different flavors–not all beans taste alike–and even from the supermarket, you have a lot to from which to choose. If you find that you do like beans, then it’s worth a venture into a gourmet store, or online to find some the wonderful heirlooms that are available. It does need a bit of planning. First, you’ll need to sort them to remove any debris like small stones and broken beans–but that’s easily done if you just put the beans on a plate or a rimmed baking sheet. Since dried beans do need to be rehydrated, it’s best if you soak your beans overnight. The quick-soaking methods are not recommended as they can affect the nutrition and the texture of your cooked beans. (Cook’s Illustrated, “Dried Beans 101). Once cooked you can freeze them so that you have a supply of cooked beans on hand when you need them. Soaking in tap water can toughen them, depending on the mineral content of your tap water. To avoid this, it’s best to soak them in brine; three (3) tablespoons of salt to each gallon of water will keep the tap water from toughening them, and even displace some of the minerals (calcium and magnesium) that occur naturally in the skins. You want to cook beans at a gentle simmer so that they don’t break up or split open. That’s easy with a slow cooker, or in the oven at a very low heat; an advantage of either of these methods is that they don’t require your attention–just a periodic check to see if they are done yet. It’s an easy thing to do on the weekend when you want to have a lazy day. In the slow cooker, they can cook while you’re away. What seasonings you use will depend on what you’re planning to do with these beans. If I’m cooking a large quantity to freeze some for various uses, I will likely keep the seasonings to a minimum–some onion, bay leaves–to have more flexibility in what I do with them later. One caution, though: it seems that most food scientists agree that adding acidic ingredients can keep dried beans from softening during cooking. So you don’t want to add acidic things (like tomatoes) until the beans are tender. If you see older recipes that suggest adding baking soda to the cooking water, I would give that a pass as the alkalinity can affect the nutrition. Occasionally you’ll get a batch of beans that just don’t soften with cooking–that probably means that they are very old, so buy your dried beans where there is a good turnover and don’t let them linger on your pantry shelf for years–go ahead and cook them and freeze them. I think that you’ll find that if you have them readily available you will use them. 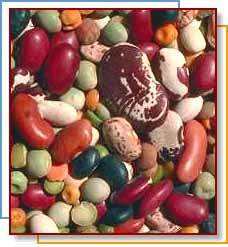 Once you “get into” beans, you’ll find that there are so many wonderful varieties. For an introduction to some of them, take a look at The Cook’s Thesaurus. Keep in mind that lentils and some “peas” don’t need soaking so may be substituted if you’ve not planned ahead. Additional nutritional information and survey of some varieties of dried beans can be found at Fruit & Vegetable of the Month (CDC). My pantry is almost never without canned beans either: black beans, navy beans, cannellini beans, pinto beans, and garbanzo as the basics, but those are more for when I’ve not planned ahead or for emergency use. There are huge differences in the taste and, particularly, the texture of canned beans, so you’ll want to explore using different brands for the “emergency” pantry stash. Some store brands (Harris Teeter) are fine for basic uses, but as the texture can vary, you need to buy according to the used–if I’m making a cold bean salad in the summer, I might want Goya, or Progresso instead.